The Bose QuietControl QC30 active noise canceling bluetooth headphones comes in the usual premium Bose packaging. The box folds open left and right revealing the headphones in a molded plastic tray. The headphones come with three sized ear tips, USB charging cable, and a largish semi hard plastic zip case. The zip case reminds me of my old Sony Discman. The lid part of the zip case has a elastic pocket that is perfect to store the charging cable. Remember that this is a US $299 pair of headphones and I expect nothing but top build quality. The QC30 feels premium. The cable is round, thick and soft. It comes out of the neck band into the ear piece without any sign of possible areas for breakage. The neck band has a matte rubber finish that is pleasant to touch. The back part of the neck band is much thinner than the front and sides. It feels good riding on my neck directly. The cables are quiet short so there are not a lot of slack when wearing the headphones. The StayHear+ QC ear tips, at least for me, are some of the most comfortable ear tips. There is absolutely no pressure in my ear canal, yet it provides a good seal so that the noise cancelation works extremely well. The neck band is light enough that I forgets it is there after a while. The neckband has one button, recessed into the band material, on the right side. It is the power button, and also serves as the bluetooth control button. The button is small and somewhat difficult to click. There are two very small, almost pin hole like, color LEDs next to the button. One is for power/charging. The other one is for bluetooth status. The power LED shows green when on, and yellow then flashing red as the battery level decreases. During charging, the LED will flash amber, and go to solid green when fully charged. If you hold down the power button for a few seconds, it will enter bluetooth pairing mode, and the LED will blink white. Solid white means the headphones is paired to at least one source. The right hand side wire also has an inline control. The inline control provide volume up and down, and a center button for play/pause. On the side of the control there are two buttons for stepping the noise cancelation level up or down. I counted 12 steps of control. I wish there is a key press that will immediately take the noise cancelation down to zero. This is available on the Bose QC20i wired noise cancelation headphones. 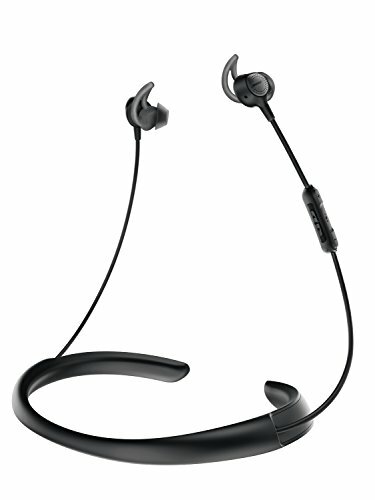 The bluetooth implementation is one of the best feature of all newer Bose bluetooth headphones, including the soundSport Wireless. The QC30 will stay connected to two devices at the same time. When one of them output audio, the QC30 will switch to that device. I normally have the QC30 paired to both my Macbook Pro and my iPhone7 at the same time. The impressive feature is that the QC30 actually stores pairing information on up to eight different devices. If the last top two devices are not available, it will go down the list until it finds devices that are available. This means that I can have the QC30 connect automatically to my work laptop plus my iPhone 7 when I am in the office, then automatically switch to my home laptop plus the same iPhone when I get home. If the QC30 takes too long in looking for a device, you can press the power button with 3 seconds of powering on to force it to go to the next device. At home, the bluetooth connection holds for about 20 feet in my semi-open house. In the office, the connection holds for over 40 feet in a open plan office. I would expect more interference in the office but that is not the case. The QuietControl QC30 took just under 2 hours to be fully charged. The battery ran out after one day of hard use, with about 3 hours of conference call and music listening inbetween. I estimated the battery life is around the claimed 6 hours total. A lot of people, myself included, use to think a bit less of the Bose sound signature. However I find that the QC30 sounds good. With Eric’s Song by Vienna Tang, her calm detailed vocals shine through clearly. On Exit Music (For a Film) by Radiohead, the deep vocals is clear without being over bearing. Yorke’s voice is haunting and you can hear all the details over the simple guitar. Sting’s A Thousand Years is my go to track for testing out deep electronic base at the beginning of the track. The QC30 performs well for a pair of earbuds style headphones. Listening to Viva La Vida by Coldplay, where Chris Martin add layers upon layers of tracks as the song build up, each instrument tracks can be heard clearly. Sound stage is wide. The sound stage is even better when playing Happy Theme Song by Grace Kelly. Her sax is punchy and warm up front as the rest of her ensemble plays in the back around her. Finally, a fun track to listen to is Black Horse and the Cherry Tree by KT Tunstall. It’s simply enjoyable through the QC30. Not to forget, the active noise cancelation works extremely well both in a simulated test environment, playing white/brown/pink noise in the background, as well as in my office. The QC30, just like the QC20, completely cuts out ambient noise from the AC and other lower frequency hums. The ear tips have enough passive isolation that I can barely hear regular volume talking 10 feet away. The one area that the QC30 seems to fall down is the microphone quality. I assume that it is using the noise canceling mics on both ear piece to capture sound. On my conference calls, the receiver on the other end tells me the audio is just ok, and is definitely assuming I am using so sort of bad mic. Since I bought and used the Bose SoundSports wireless as my primary running and around the house headphone, I have been waiting for the QC30 to come out. The QC20i (wired noise canceling version) has been my travel headphones for a while so I know the noise cancelation is going to be as good on the QC30. Together with the great bluetooth implementation, the QC30 is now my main headphones for everything — office, gym. I only switch to my high end setup when I am sitting down for a true music session. The convenience and the comfort of the QC30 simply is a winning combination for everyday use.